Stay in Several Spa-licious Places That Won't Break the Bank! Ready for some relaxation? This is an affordable spa vacation that won’t have you worrying about the cost while you’re trying to de-stress. From jungle to cloud forest to beach, you’ll enjoy the best of Costa Rica while taking a tour of some of our favorite hotel spas. What better place to enjoy volcanic mud wraps, thermal hot springs, and a seaweed body wrap than the place that naturally offers volcanoes and oceans? It was meant to be! This vacation is designed for total relaxation while you pamper yourself with the best treatments. With just the right amount of action that won’t spoil the mellow mood, you’ll get a taste of all Costa Rica has to offer without over-exerting yourself. Those that prefer scented candles and soothing music to adrenaline will love this spa vacation. Exclusive Airport ‘Meet and Greet’ service—we’ll greet you off the plane and going through customs will be as easy as pie. Private transfer to Arenal Kioro with an English speaking driver. 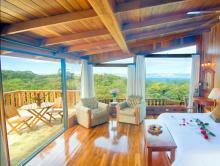 Three nights lodging at Arenal Kioro—including breakfast. Adventure connection transfer from Arenal to Monteverde with a coffee and chocolate tour and lunch. Two nights lodging at Hotel Belmar—including a sustainability tour. Sky Tram and Sky Walk tour. Private transfer to Hotel El Parador Resort & Spa with an English speaking driver. Three nights stay at El Parador—including a buffet breakfast. Private transfer back to San Jose Airport for your flight home. Begin your Costa Rica spa vacation as you arrive in San José. No stress here as one of our representatives helps you navigate the airport and show you to your private transfer. 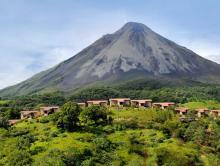 Travel to the Arenal area where you will stay at the Arenal Kioro Suites & Spa. Wake up to the sounds of the jungle and the impressive views of Arenal volcano. Step outside to watch the birds and other animals—no traffic sounds around, just nature. Head down for a relaxing day at the spectacular Neidin Spa. The aim of this spa is to make you feel pampered and fresh, so enjoy a massage, a body wrap, or a facial treatment catered to your specific needs. Is there a better way to start off a vacation? Next up, venture into the hotel’s volcanic hot springs. There 7 hot spring pools in total, all of them with hydro-massage. Delight in an afternoon at the thermally heated water as you soak in its rejuvenating properties. Today you head to Monteverde, with some fun along the way. Cross the majestic Arenal Lake by boat while you take in the views of the volcano, islands, and mountains. 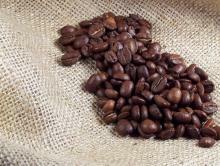 Once across, learn about two of Costa Rica’s most delicious products. You’ll enjoy a visit to a coffee farm where you’ll get an informative walk around the fields before watching the process of turning cocoa beans into chocolate. Break for lunch, try some of the country’s famous coffee, and then continue the journey to your hotel in the cloud forest, Hotel Belmar. 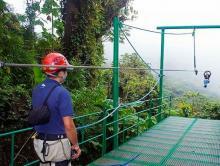 See what the cloud forest is all about on a Sky Tram & Sky Walk adventure. Start with a slow-paced gondola ride over the cloud forest, where you’ll see the scenery from tree-top level. Then enjoy a guided walk through the rainforest over a series of bridges and trails. You’ll have plenty of opportunities to spot wildlife, so keep your eyes opened! Now you’re off to the coast! 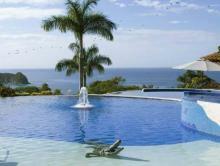 A private transfer will take you to Manuel Antonio where you’ll stay at the El Parador Resort & Spa. Where it sits, nestled between jungle and coast, you can enjoy stunning views and wildlife sightings. Choose from the extensive list of treatments offered at the Pacifica Spa. With complete packages and an a la carte menu, you can just let stress melt away as you listen to the music of the surrounding jungle. Today, get out and explore Manuel Antonio on a Catamaran Island Adventure. Enjoy the sunshine as you tour the coastline of arguably one of the most beautiful areas in the country. 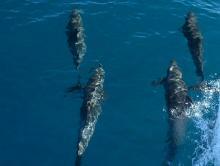 See the national park from off the coast, keep your eyes open for dolphins, and stop to take a dip in the tropical waters. That’s how to end your trip on a high note! A private transfer will take you back to San Jose where you will catch your flight back home. This Monteverde tour is great for anyone interested in learning the history and growing process of coffee and chocolate. This is a once-in-a-lifetime opportunity to experience the cloud forest from a different perspective while mixing nature with adventure.